Does Carpal Tunnel Cause Shoulder Pain? Is Carpal Tunnel Causing Your Shoulder Pain? Carpal tunnel syndrome is a painful, progressive condition that typically affects the hands and wrists but is not restricted to just these areas. Shoulder pain is also one of the symptoms of carpal tunnel. When you change the position of your wrist and hand to compensate for the pain, it puts excessive stress on the shoulder muscles resulting in pain in the area. There is no one definitive cause of carpal tunnel shoulder pain and all shoulder pain is not necessarily due to carpal tunnel. That is why it is important to first get a confirmed diagnosis by an experienced pain specialist. Depending on the cause of and severity of your symptoms, your pain doctor in New York may recommend a few conservative or minimally invasive treatments to reduce the pain and increase mobility. Repetitive movement of the arm and shoulder puts excessive pressure on the nerves in the area, which results in carpal tunnel shoulder pain. The best way to reduce this pressure and the resulting pain is by limiting any arm and shoulder movement. Depending on the severity of your symptoms, your pain doctor in NY may recommend wearing a shoulder brace, which is designed to support your shoulder and arm and limit movement. Placing an ice pack on the painful area for five to ten minutes two or three times a day helps to ease the pain by reducing swelling and inflammation. This should be done in conjunction with rest and immobilization. You may need to switch over to heat after a few days of icing. Applying heat to the area helps open up the blood vessels, increasing blood flow and oxygen supply to the shoulder muscles, which promotes healing and improves mobility. Your pain doctor may also prescribe non-steroidal anti-inflammatory drugs such as ibuprofen or nonoproxen, or other nonprescription pain relievers to alleviate the pain and reduce swelling. It is important to take these anti-inflammatory medications exactly as instructed to prevent potential side effects. If your pain does not decrease after taking the anti-inflammatory medication, your pain doctor may administer steroid injections in the shoulder bursa area. These cortisone injections reduce inflammation around the median nerve, soothing the painful symptoms. Reducing the swelling and pain with steroid injections also helps speed up recovery by making it possible for you to start stretching and strengthening exercises. After the pain and swelling subsides sufficiently, your pain doctor in New Jersey may refer you to a physical therapist who will teach you a few stretching and strengthening exercises. Physical therapy is an important part of the recovery process. Stretching exercises help improve the flexibility and range of motion of the shoulder muscles, allowing you to use them again without the associated pain. Strengthening exercises strengthen the shoulder muscles and prevent the numbness and weakness from returning. Your physical therapist will also teach you to perform everyday tasks correctly without putting too much pressure on the median nerve, which could cause the symptoms to recur. Following proper ergonomic guidelines is the key to keeping carpal tunnel shoulder pain at bay. Fortunately, this is not hugely complicated – it’s just a lot of little things done right. Ultrasound Therapy is an advanced form of heat therapy, which is far more effective than a simple heat application. In ultrasound therapy, sound waves are used to raise the temperature in your shoulder. This increased temperature alleviates the pain and accelerates healing. Your pain doctor in NJ may schedule you for multiple ultrasound sessions stretched over a period of a few weeks. Viscosupplementation involves injecting hyaluronic acid into the shoulder joint. Hyaluronic acid is a type of lubricating fluid. When injected into the joints, this fluid lubricates the joint, improving the shoulder gliding process and minimizing joint inflammation and pain. Your pain doctor may recommend PRP or Platelet Rich Plasma Therapy to treat your carpal tunnel shoulder pain. This treatment involves injecting you with platelets and growth factors extracted from your own blood. These platelets and growth factors initiate natural healing by arousing the surrounding stem cells and body tissues. Studies have shown that performing certain yoga postures that are focused on stretching, balancing, and strengthening the upper body and joints can help improve grip strength and decrease pain. Carpal tunnel is a progressive condition, which means the symptoms may be mild in the beginning but will continue to get worse without timely intervention. Early treatment can slow down the progress or even stop it in its tracks. 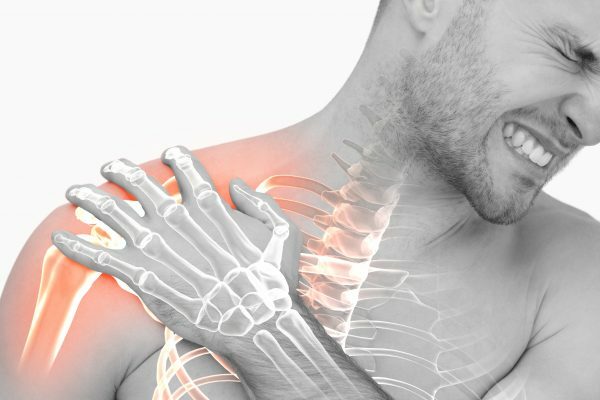 Shoulder pain could be caused by a number of reasons, so the first thing to do is to make an appointment at a pain treatment clinic and get an accurate diagnosis. Before performing any diagnostic tests, your pain doctor will first want to know more about your daily activities to determine whether it could be due to carpal tunnel or some other medical condition. Depending on the primary diagnosis, your pain doctor may then ask you to get an ultrasound or MRI. These tests will help your doctor identify where the nerve is swollen or compressed and whether it is due to carpal tunnel, arthritis, or some other reason. If you are experiencing shoulder pain, don’t wait for it to get worse. Call VIP Medical Group and make an appointment with a pain specialist so you can get your should pain diagnosed and treated on time. At VIP Medical Group you will be treated by a team of pain specialists who are as compassionate as they are experienced. What are spinal infection symptoms? | How do I treat a spinal infection?